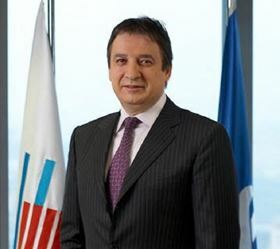 Prof Dr Ahmet Kirman – vice chairman and CEO of Sisecam Group. Glass fiber specialist Sisecam, based in Turkey, has approved a major investment of 400 million TL (around €100 million) to build a new glass fiber plant in that country. The new plant, which will have an annual production capacity of 70,000 metric tonnes, is expected to become operational in the second half of 2018. The Sisecam Glass Fiber business, originally Cam Elyaf Sanayii AS, is now part of the chemicals division of the Sisecam Group, and remains the sole manufacturer of glass fibers in Turkey. The planned new plant will be located in Balikesir, the north-western part of Turkey, close to the Aegean region industrial cluster where around 80% of wind energy manufacturers in Turkey are now located. The new plant will produce the company’s current range of E-glass fiber reinforcement products supplied as strands, mats and bobbins for producing a variety of glass fiber filled engineering thermoplastics, phenolic brake pads, gypsum reinforcement, and GRP composite end applications typically using unsaturated polyester, vinyl ester, epoxy and polyurethane resins. The range of Sisecam glass fiber products the new plant will produce includes chopped strands in standard and custom lengths, emulsion and powder bonded chopped strand mats (CSM) for both open moulding and continuous production of GRP panels, multi-end continuous strand rovings for GRP production processes such as spray-up, continuous lamination, and sheet moulding compound (SMC) applications and single end continuous rovings for filament winding, pultrusion and weaving. Key manufacturing sectors supplied by Sisecam glass fiber include wind energy, automotive, land transportation, marine, industrial, building and construction. To meet the specification requirements of key industry sectors, Sisecam glass fiber products have various DNV-GL, Lloyds Register and FDA compliance certifications. This story is reprinted from material from Sisecam, with editorial changes made by Materials Today. The views expressed in this article do not necessarily represent those of Elsevier. Kordsa says that a new production line of polypropylene monofilament fiber reinforcement, based in the company’s İzmit, Turkey, plant, is now operational.